This town on the Ayrshire coast is the terminal for the Arran ferry and so has good road and rail links. The harbour is a good starting point with the best viewing from the Marina (NS 225 423): follow the signs for the ferry and bear right into the Marina. You can drive through the gates and go round the inner harbour and park just beyond the Harbour-master’s tower. Beyond the breakwater is Horse Island (NS 213 427). This is an RSPB reserve and although access is not possible, you can get reasonable views through a ‘scope (although avoid the afternoon sun – not a common problem on the west coast!). The next location is North Beach (NS 229 432) as shown in the photo on the right. On leaving the Marina take the left turn at the traffic lights and follow this round for about a mile until the beach can be seen on your left. Park near the toilet block at the junction with the A78. This was where the Snowy Egret was found in December 2001 (see the Photo Gallery for some excellent shots of this bird). The Calmac ferry to Brodick on the Isle of Arran is a mini-pelagic. Car park at the Marina but uneven surface. On National Route 73 to the Arran ferry and coastal path to Largs. Linked to National Route 7 at Kilwinning. The harbour area can give close views of Black Guillemot with several pairs nesting. The rocks at North Beach are good for Redshank , Oystercatcher , Turnstone , Ringed Plover , Wigeon . This part of the coast is a magnet for Eider , especially during eclipse with large rafts forming. The field behind the roadside restaurant (at NS 220 444) often has a flock of Curlew numbering several hundred and up to 0 Twite . The track just before the restaurant goes up to Montfode Farm. After you go under the railway bridge there are some horse stables and ruined buildings up the hill. There are regular sightings of Buzzard (4+) plus occasional Barn Owl and Tawny Owl . The rough field towards the houses contains breeding Whitethroat , Grasshopper Warbler , Sedge Warbler . And of course, there was that Snowy Egret ! There is a cycle-path/walk way going from Ardrossan north along the coast towards Seamill and beyond. 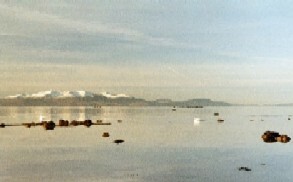 This gives great views of the coast with Arran beyond. For details of ferry times, Calmac’s phone number in Ardrossan is 01294-603226.